How did the NYC Off-leash Hours policy begin? What is the Parks Department's policy on dogs off-leash? For approximately 20 years, Parks has allowed dogs to be off-leash in certain specified parks, in certain specified locations, during restricted hours. Frequently those hours are 9pm in the evening through 9am in the morning (though further restricted to only when the park is officially open). In 1990, the first official off-leash dog park appeared in Tompkins Square Park. A few years later, several other dog parks were created specifically for dogs to have an enclosed area to be off-leash. There are currently approximately 40 dog parks in NYC. With the advent of official dog parks, the Parks Department made its off-leash dog policy that where an official dog park exists in a park, there are no Off-leash Hours; dog owners must use the official dog park and not allow their dogs off-leash, even during 9pm-9am. However in parks without an official dog park, which constitute the vast majority of parks in NYC, with permission from the Parks Department, dog owners may allow their dogs off-leash from 9pm-9am but only while the park is open. I don't own a dog. How does the Off-leash Hours policy benefit me? Well socialized and exercised dogs benefit the entire City with less barking, less on-leash aggression, less tendency to become territorial, friendlier behavior towards people and other dogs, and, as Health Department statistics over the past 20 years clearly show, a dramatic decrease in the number of dog bites. Additionally, the past three Parks commissioners and many borough Parks administrators have partially credited dog owners who use the Off-leash Hours with helping to bring the Parks back from their state of decline and crime. Dog owners continue to keep the parks safe in hours where many people do not use them, 7 days a week, 365 days of the year, in all types of weather. Why do dogs need off-leash time? Shouldn't a good owner be able to just walk his/her dog on leash to get the dog socialized and exercised? Over the past 20 years, science has began to understand that most dogs, both large and small, require some off-leash time outside every day for proper socialization. Scientific studies show that dog behavior when a dog is on-leash tends to be more aggressive, more territorial, and more anti-social towards people and other dogs. When dogs are allowed time off-leash, studies show that they are far more social towards people and other dogs, considerably less aggressive, bark less, bite less, and tend to have far less neurotic behavior than dogs who get no off-leash exercise. Why do dog owners need to use the Parks to socialize and exercise their dogs? Why don't they take their dog to an official enclosed dog park? Why not build more dog parks? If only there were enough dog parks. The first dog park in NYC was built about 15 years ago, and at this point there are approximately 44 dog parks. Although there are some outstanding dog parks in NYC, some of these 44 dogs parks are very small and can not accommodate many dogs. It's impossible for the City's half million dog owners and 1.4 million dogs (that comes out to over 30,000 dogs per dog park) to be served by 44 dog parks alone. It takes approximately $125,000 and several years of community activism to build a single new dog park in New York City. The Parks Department, though strong supporters of the Off-leash Movement through their commitment to both build dog parks and Off-leash Hours policy, does not have the budget to build enough dog parks. Also, land prices, landmark restrictions and community preference, make Off-leash Hours the right policy solution in conjunction with the creation of new dog parks. Doesn't the City's Leash Law prohibit dogs off-leash in public at all places and at all times? Isn't the Off-leash Hours policy illegal? These questions were finally and unequivocally put to rest by New York State Supreme Court Judge Peter J. Kelly's written decision on November 30, 2006 in the case of Juniper Park Civic Association v. The City of New York, NYC Parks Department, when the judge concluded that the Off-leash Hours Policy always has been and continues to be legal and within the discretionary power of the New York City Parks commissioner. This ruling came from the failed legal attempt by the Juniper Park Civic Association, a small group in Middle Village, Queens, to eliminate Off-leash Hours recreation in all New York City parks. Six days later, on December 5, 2006, the New York City Health Board heeded Judge Kelly's written recommendation to amend the New York City Health Code to eliminate any discrepancy in agency regulations that could result in further lawsuits. The Health Board amended Section 161.05 of the Health Code (the "Leash Law") to specifically grant the New York City Parks commissioner limited discretionary authority to allow dogs off-leash in New York City parks. On April 10, 2007, the Parks Department amended its regulations to specifically mention the previously unwritten Off-leash Hours policy, formally allowing dog owners to allow their dogs to be off-leash in certain areas of designated parks between the hours of 9pm until the park closes, and then from when the park opens until 9am. The amended regulations went into effect one month later on May 10, 2007. A complete list of parks that allow Off-leash Hours recreation is on the NYC Parks Department's Website. Aren't all these dogs running off-leash every morning destroying the parks and making parks unsanitary with their excrement? 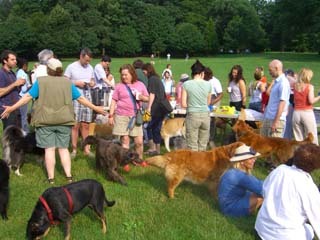 Off-leash groups such as FIDO in Prospect Park and Central Park PAWS are consistently thanked by the employees and management of the parks for helping them to keep the parks clean. Ask most parks employees and they will likely tell you that after off-leash each day, the areas are cleaner because many dog owners who use the off-leash hours take great pride in the park and treat off-leash as a cherished privilege. People consistently in the park each morning or evening, take a great interest in keeping the environment clean and protected. The parks are going to the dogs! Aren't parks built for people, rather than dogs? The dogs don't walk themselves to the park. Taxpaying dog owners are the largest single activity-specific user group in NYC parks. And dog owners are in the parks every day of the year, in all types of weather. Recreating with one's dog--throwing a ball, frisbee, running, walking, benefits dog owners as much as their dogs, and for the past 20 years, has been recognized by the Parks Department as a legitimate recreational activity within the bounds of the Limited Off-leash Hours Policy. I've seen dog owners in parks abusing the off-leash rules. We should ban Off-leash Hours Policy because some dog owners are irresponsible. If the irresponsible actions of a small percentage of activity-specific parks users were reason to ban those activities in NYC Parks, there would be no cycling, rollerblading, baseball, football, frisbee, running, and many other activities. All of these activities result in real injuries to other Parks users each year. A small percentage of people who participate in these sports/activities abuse their privileges, break the rules, and violate the law. The solution is to stiffen enforcement of the rules and laws and to educate users about the rules through placement of better signage and a continuation of pamphleting done for many years by the local community Off-leash groups. Off-leash dog owner groups spend a significant amount of time and effort each year educating Off-leash Hours users about the rules and try to self-police Off-leash Hours. The various groups that comprise the Off-leash Movement are strongly in favor of stiffer fines, better signage stating the rules, and strong enforcement of the law and are ready to work even closer with Parks authorities to make sure everyone understands and obeys the rules. Off-leash dog owners have been repeatedly credited by Parks Commissioners with helping reclaim NYC parks from crime, violence, and decline. The half million taxpaying dog owners of NYC deserve and need outdoor space to recreate with their dogs. Off-leash recreation better socializes dogs, resulting in better canine citizens which benefit the communities in which they live. Off-leash Hours policy gets people into the parks, bringing New Yorkers together and making the City a more pleasant place. Dog owners who use Off-leash Hours are a strong deterrent against crime in the parks early in the morning and late in the evening. New York's dramatic reduction in dog bites from over 40,000 annually before off-leash privileges to just under 4,000 annually in 2005 coincides with the advent of the Off-leash dog recreation, official Off-leash Hours and dog parks. Dogs off-leash in a natural setting playing, running, and being themselves are a beautiful sight for dog owners and most non-dog owners. Many other cities and municipalities have agreed that providing off-leash opportunities makes good public policy and has has overall positive effect that strongly outweighs any negatives. Throwing a ball, running with, and playing with one's dog is a legitimate park recreational activity. Though dog parks are great, there are not nearly enough of them to meet the demand from 500,000 dog owners.